Fully installed in as little as 40 minutes! 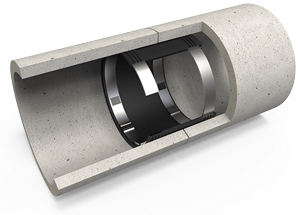 Since the 1960s VIP-Weco internal pipe seals have been used worldwide for trenchless rehabilitation of pipes and sewers for industrial water, drinking water, waste water, fuel and gas. During the installation process, rubber sleeves made of EPDM or NBR compounds are applied over the damaged area of the inner wall of the pipe. The rubber sleeve is then held in place by stainless steel retaining bands allowing up to 20 bar of internal or up to 2.0 bar of external pressure. Following installation of clamping bands in the corresponding grooves of the sleeves, a safe, durable and low-cost mechanical sealing solution is achieved. Typical installation time of circa 40 minutes per seal. For special applications, we develop customised sealing solutions on request. 1). Comprises two stainless steel retaining bands and a vulcanised rubber sleeve. Suitable for sealing in-filtration leaks of up to 0.4 bar and will also seal ex-filtration leaks of up to 20bar depending upon the host pipe material and available in widths of 280mm or 480mm. Operating temperatures are -10 to +80 degrees Celsius (other materials offering a wider range capability available upon request). 2). Comprises three stainless steel retaining bands and a vulcanised rubber sleeve and a stainless steel retaining sheet. Suitable for sealing in-filtration leaks of up to 0.8 bar and will also seal ex-filtration leaks of up to 20bar depending upon the host pipe material and available in widths of 280mm or 480mm. 3). Comprises four stainless steel retaining bands and a vulcanised rubber sleeve and a stainless steel retaining sheet. Suitable for sealing in-filtration leaks of up to 2.0 bar and will also seal ex-filtration leaks of up to 20bar depending upon the host pipe material and available in widths of 280mm or 480mm. 4). For end liner sealing applications; Comprises two stainless steel retaining bands and a vulcanised rubber sleeve. 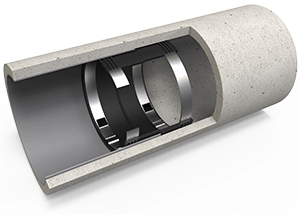 Suitable for sealing in-filtration leaks of up to 0.4 bar and will also seal ex-filtration leaks of up to 20bar depending upon the host pipe material and available in widths of 280mm or 480mm. Smallest diameter is DN220. 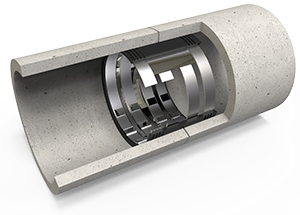 This is the best solution for permanently sealing the end of Cured In Place Pipe linings (CIPP). Operating temperatures are -10 to +80 degrees Celsius (other materials offering a wider range capability available upon request). The VIP-Weco End Liner Seal is compatible with all other configurations of VIP-Weco Seal. Available in various grades of rubber/ stainless steel to suit more aggressive environments.